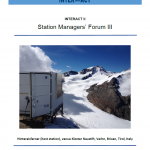 The INTERACT Station Managers’ Forum meeting III was held 19-23 March 2018 at Kloster Neustift, Varhn, Brixen, Italy. The meeting was attended by 40 participant representing 32 research stations. Focus of the meeting was on status and continued development of SMF tasks and deliverables, including three workshops. The minutes are now available below. Next: INTERACT IS NOW ON INSTAGRAM!